About 10" (25.5 cm) tall. 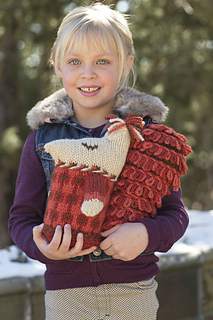 Many traditional mitten-making techniques have been used to give this toy squirrel plenty of character and charm. Risto is knitted in the round using five double-pointed needles, he has a decorative two-color braided cast-on, a twined purl-stitch band, stranded-colorwork patterning, peasant thumb openings for his arms, and decorative twisted-braid details. 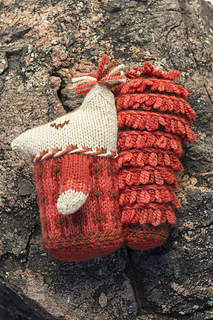 His fabulously bushy tail is also knitted in the round using five double-pointed needles and is decorated with traditional Estonian mitten fringes. 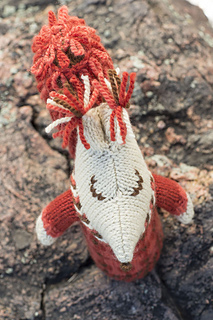 Risto the Squirrel is knitted in a chunky pure wool. Once he is completed, he should be washed in warm soapy water and left to dry flat. He is filled with a pure wool toy filler. Any weight of yarn can be used to knit Risto—you just need to follow the suggested gauge of whichever yarn you substitute with. If you were to use a finer yarn such as a Shetland four-ply, in a softer, sweeter color palette, a smaller Risto would make a very lovely toy for a baby. Set of 5 size U.S. 9 (5.5 mm) each one 4” (10 cm) and two 8” (20 cm) double-pointed (dpn). Adjust needle size if necessary to obtain correct gauge. 15 sts and 17 rnds = 4” (10 cm) in chart patt. 14 sts and 20 rnds = 4” (10 cm) in St st after washing. Marker (m); holder; waste yarn; pure wool for filling; tapestry needle.